Last week saw my first proper week in the inida office and it has gone very well. I know I keep banging on about it and I feel like I am repeating myself, but the people are so nice. Really friendly. The indian people seem to have a completely different mentality, attitude and outlook to us back home. There is certainly less animosity and bad blood around the place thats for sure - and alot more smiles, good will and hilarity! I've already made some nice friends in Shabri, Shyam, Manu (who supports Man U funnily enough), Vikas (DJ Dingu), Sabitha, Harini and last but certainly not least, Dennis. Its a shame I mostly work USA and UK hours, because it means I dont get to see an awful lot of them but I'm sure as I'm here for a while it will be fine. On firday night we finish at 10pm, and last friday we went onto eat at a really nice hotel. The restaurant is on the 7th floor and is basically like a massive balcony overlooking the rest of the city. What I like about this place especially is the fact that almost none of the buildings are built higher than the natural surroundings. This gives the place a feel like it is plonked in the middle of a jungle and its all very green. 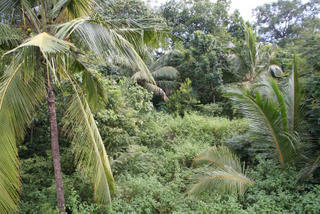 The pic below is the view from the back of our house.